The personalised Dementia assistance cards are getting amazing feedback and we are soon to hit the 5,000 download mark which is wonderful. 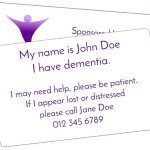 I am one step closer to producing a sheet of 8 printed dementia assistance labels for people. Sadly this will take a while to complete as the programmer who built the software that makes the card editing possible is unable to work with me presently as his baby daughter has been gravely ill. I have however managed to produce 4 edited/personalised labels which are self adhesive. These are idea to stick on walking sticks, frames, mobility scooters, wheelchairs, wallets, clothing etc. They are sadly not waterproof but this can be achieved either with some clear nail polish or sellotape! Please contact me here if you would like some labels for someone with dementia.